18 cm long (7 inches). 14 cm tall. 13 cm width. Excellent quality cyberpunk Skull Ornament with smooth surface. Weighty feel. 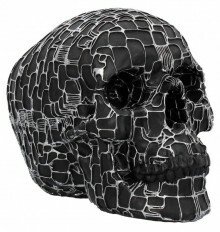 Check out the other skulls in this collection, and decorate your home with them! June 2018 release from Nemesis Now.